Sometimes it’s important to practice restraint and other times, you just need to throw it out the door. My gingered cranberry and pear crisp with almond streusel is a very good example of when it’s a good idea to kick restraint to the curb. In this fall crisp, pears and cranberries bake together to make a perfect sweet-tart combination. Fresh ginger adds a pleasant amount of heat that warms the back of your throat, almost like you’re sipping bourbon. 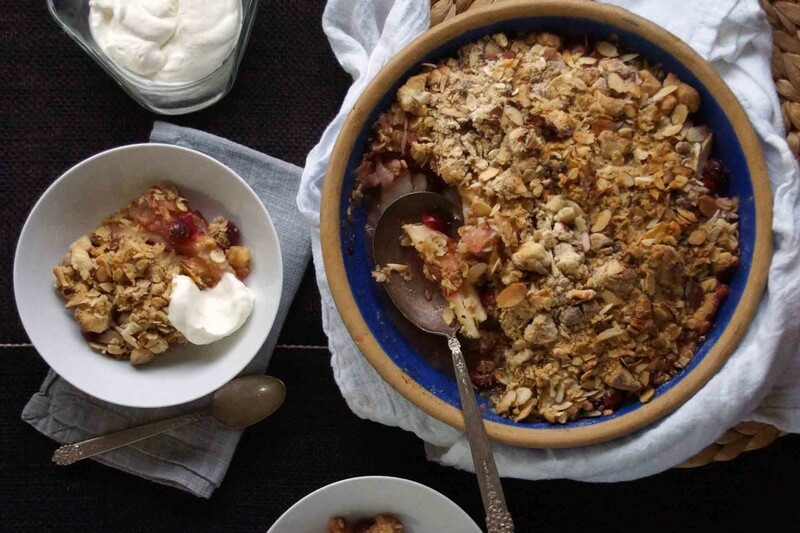 And an abundance of almond-oatmeal crumbly crisp topping? Don’t even get me started. Shall we make dessert? 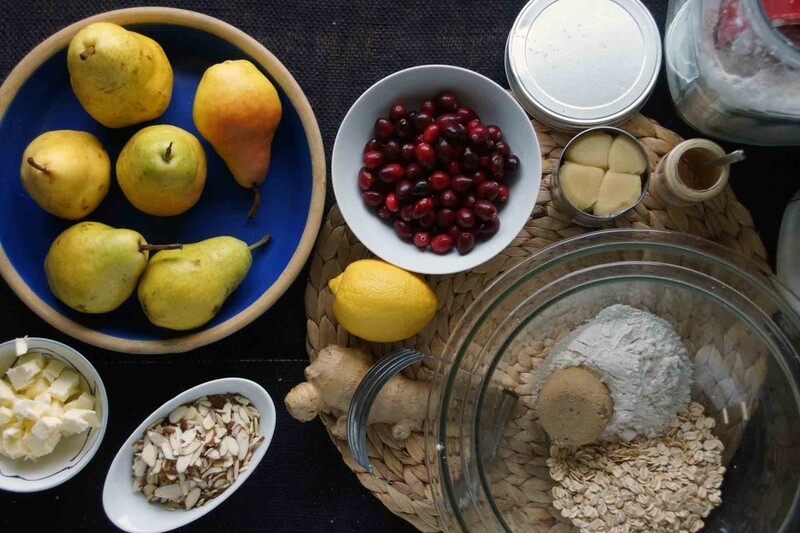 Grab those pears off the counter, your bag of ruby red cranberries, a knob of ginger, and a lemon. 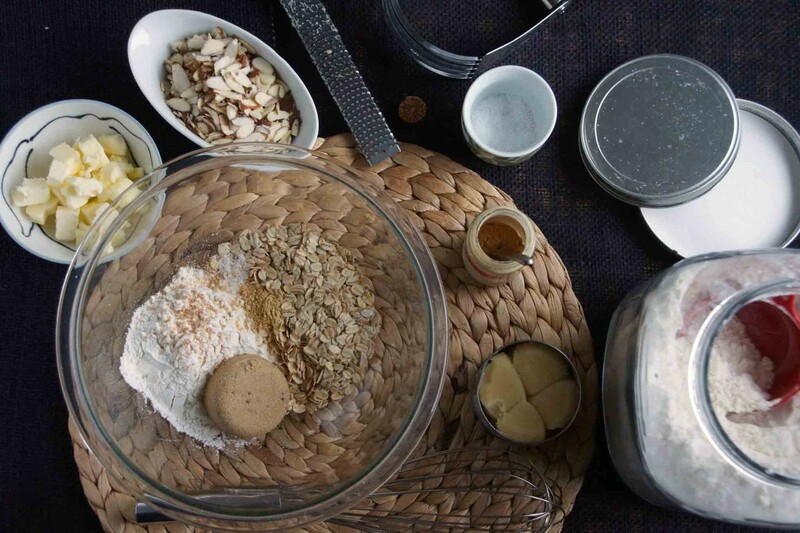 Raid your baking supplies and get your hands on flour, oatmeal, sliced almonds and almond paste, butter, and sugar. Ground ginger and nutmeg from the spice drawer and we’re good to go. We’ll start by making the topping. Toss oatmeal, brown sugar, flour, ginger, nutmeg, and a pinch of salt together in a bowl. 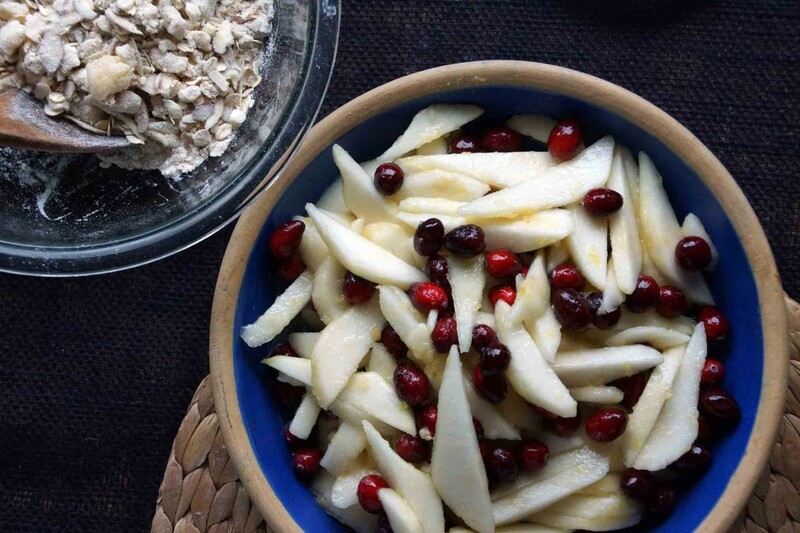 Cut in butter, crumble in almond paste, and stir in sliced almonds. Easy as pie…wait, easier than pie. If you’re crust-phobic, this crisp would be a perfectly delicious stand-in for pie at your Thanksgiving feast. Now let’s move on the fruit. Peel and slice the pears and throw ’em into a big bowl. 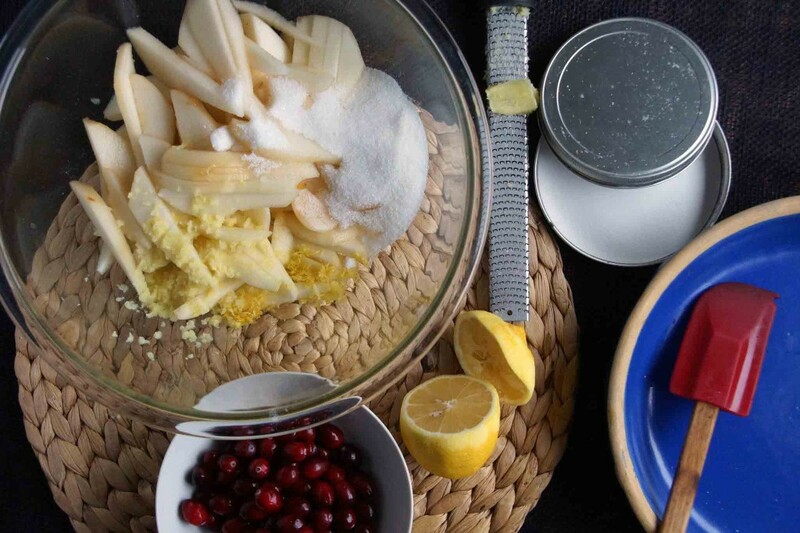 Add a cup of cranberries, lemon zest and juice, sugar, and freshly grated ginger. Toss to combine. 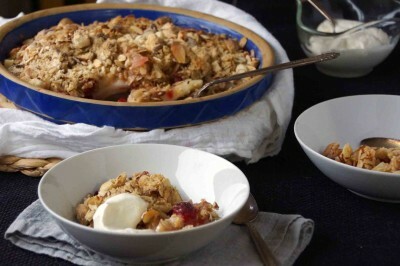 Transfer the fruit to a baking dish or pie plate and cover with the crumbly crisp topping. Pop it in the oven and appreciate how unbelievably good your house smells. When the fruit is bubbling hot and tender, the topping crisp and golden, take it out and let it cool for a few minutes before serving. You don’t want to go and ruin everything by burning your tongue, plus it’ll give the juices a chance to gel up a bit. Brew a pot of coffee and whip some cream in the meantime. Keeping with my theme of pulling out all stops, I added a spoonful of crème fraîche to my whipped cream. Then I ate a bowl. And evened out the pan a bit. Then licked the spoon. I was on a roll. You will be too. I love the combination of ginger and pear. The cranberries provide a touch of tartness and the almond paste that gets crumbled into the topping takes this simple dessert to the next level. 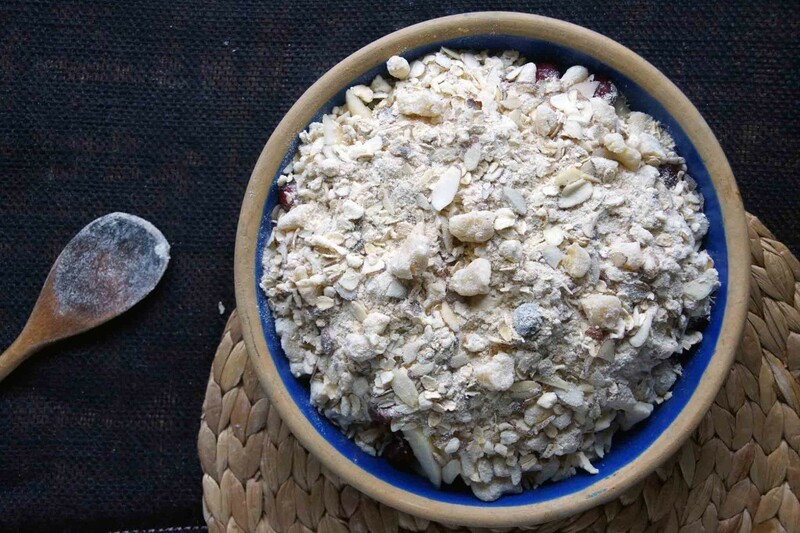 In a medium bowl, whisk together flour, oatmeal, brown sugar, ground ginger, nutmeg, and salt. Cut in the butter using a pastry blender, your fingertips, or a food processor until the mixture looks like coarse sand. 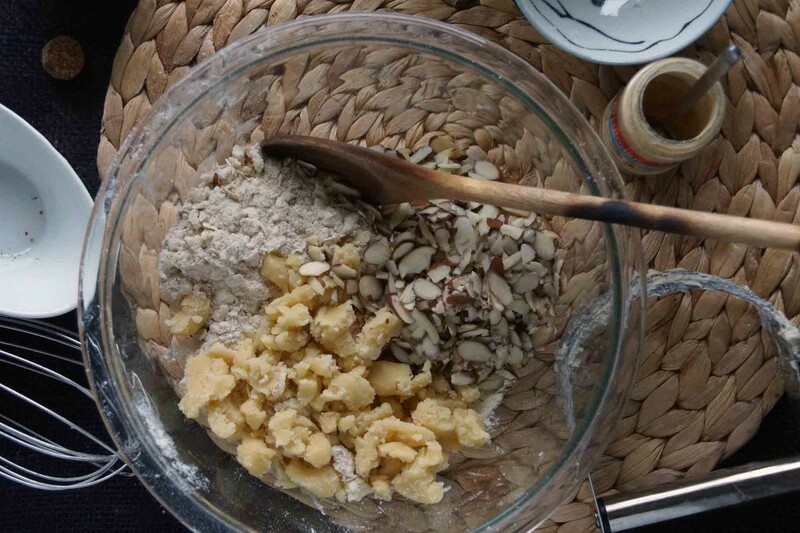 Crumble in the almond paste (this can be left in larger pieces) and stir in the sliced almonds. Set aside. 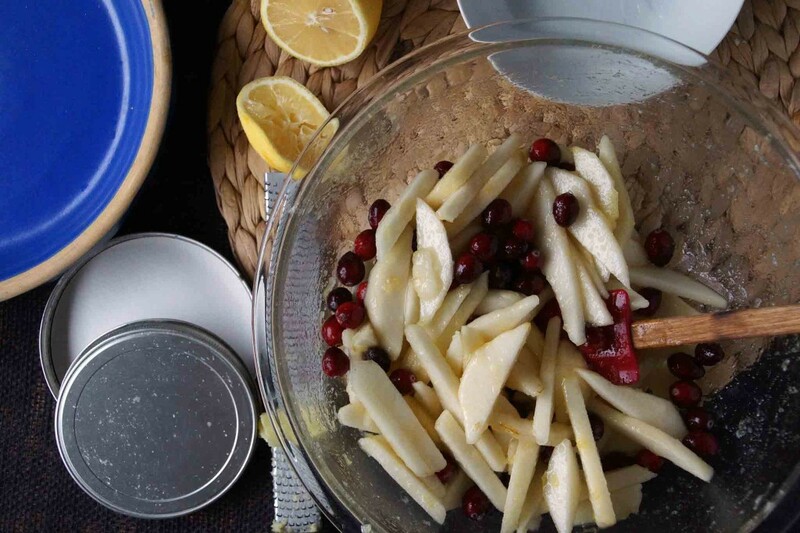 In a large bowl, combine the sliced pears, cranberries, sugar, lemon juice and zest, and grated ginger root. Toss together until everything is well combined. Transfer the fruit mixture into a deep pie pan or an 8 in. x 8 in. baking dish. Evenly top with the flour and oat mixture. Bake until the fruit is bubbling and has begun to collapse and the topping is golden brown, 40-45 minutes. Allow to cool for 10-15 minutes before serving. Serve with whipped cream, crème fraîche, or ice cream. Yummy, yummy, yummy! I am so tempted to make this instead of the apple pie everyone wants for Thanksgiving! And it looks so great in your blue pie dish! 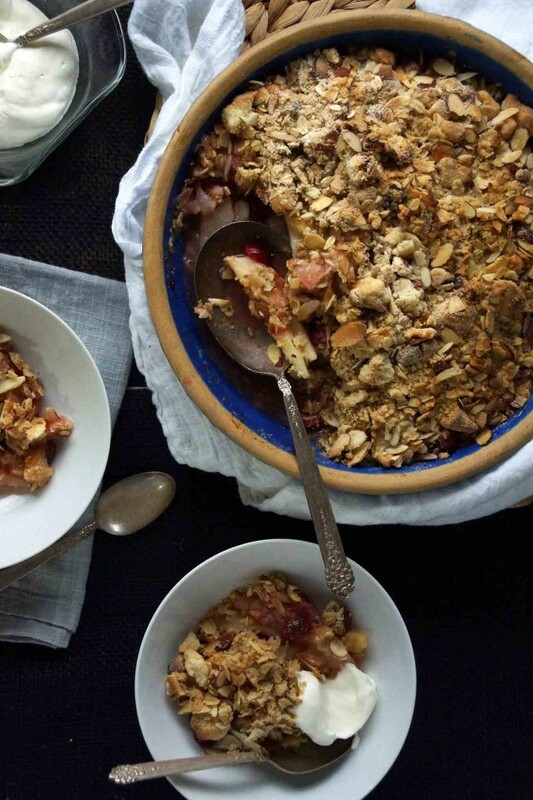 It’s hard to mess with your apple pie for Thanksgiving…the crisp is good anytime! Crisps have always been my favorite. In second grade we submitted recipes for a class cookbook and I submitted Apple Crisp. And I’ll never forget it! I love the brightness of the cranberries and anything with almond paste is guaranteed to be delicious, right?!? I’m happy I can provide a “healthy” alternative!